Count Antony Dimera first appeared in Salem in 1981. He had come to town to get back his wife, Liz Chandler. Their divorce had never been finalized so they were still legally married. When Tony arrived, Liz knew that her marriage of only a few months to current husband Don Craig was invalid. Don left Liz after finding her in a robe at Tony's place. Liz was forced to live at the Dimera mansion but she and Tony maintained separate bedrooms. Although he had come to Salem after Liz, Tony set his sights on Lee Dumond's younger sister, Renee. He overwhelmed Renee with flowers on her birthday and showered her with gifts: a horse, a diamond necklace, a cat named Moonshine. Lee was furious and wanted Renee to stay away from Tony. The serial killer nicknamed the Salem Strangler attempted to kill Renee on two separate occasions. After a third attempt on her life, Tony took Renee into hiding for her protection. Tony finally proposed to Renee but she had learned that she and Tony were in fact siblings: she was the daughter of Lee Dumond and Stefano Dimera. When Renee broke up with Tony, he blamed Stefano for exerting undue influence and went to Lee's penthouse. There, Renee showed Tony the evidence that she was in fact his sister. Subsequent blood tests seemed to prove it. Stefano held a lavish coming out party for Renee and gave her his mother's pearls. He insisted that both Renee and Tony, his children, stay in Salem. When Tony refused, Stefano collapsed, faking a heart attack. Liz pressed Tony for a divorce and threatened to leave, so Stefano arranged to have a bomb explode in the hotel room of her lover, Dr. Neil Curtis. Then Tony raped Liz. Terrified, Liz told friends that she had decided to stay with Tony after all. But Don didn't buy it. He promised Liz that he would help her prove the Dimeras were behind the blast that injured Neil. From his hospital bed, Neil vowed to kill Tony. By mid-November of 1983, Tony obtained new lab tests that showed that he and Renee were not siblings after all. By then, Renee had married David Banning, Kayla Brady's former boyfriend. She was however still in love with Tony. Tony told Liz he would give her a divorce but that he wanted to keep the baby she was carrying. Lize believed that the baby was Neil's. She tried to get evidence that Tony and Renee were having an affair, hoping it would help her obtain a divorce. Nothing she did, however, could release her from the Dimera control. Stefano took Liz and Marlena hostage at a mountain hideout where he prepared to flee Salem. Roman, Neil and Abe found them before Stefano could make his escape, but while the rescue was underway, Liz went into labor and delivered a baby girl she named Noelle. Tony gave Liz a divorce. Stefano was arrested, and while in prison he had a massive stroke and died. Tony went to Las Vegas with his secretary, Anna Fredricks Brady, who was the ex-wife of Roman Brady. Anna drugged Tony and with the help of a crooked justice of the peace, married him. Stefano's will stipulated that in order to inherit his millions, Tony and Renee had to live under the same roof for a year. Furthermore, Renee could not divorce David. There was also a clause that whoever -- Renee or Tony -- had a child first, would inherit an additional five million dollars. So Renee and David moved into the Dimera mansion with Tony and Anna. When Anna was preparing to go sailing, Renee, who had already miscarried David's baby, rigged the boat to sink and kill Anna, who was by then pregnant with Tony's baby. However, Tony was also in the sailboat and was injured. David saved both Renee and Tony, but Anna lost the baby she was carrying. When Tony learned that Anna had duped him into marrying her, he divorced her, even though she was truly in love with him. She left Salem but returned the following year and became Tony's secretary once again. Stefano secretly came back to town and locked Tony in a secret room in his penthouse while Tony's lookalike cousin Andre masqueraded around Salem as Tony. When Anna discovered the real Tony, she was imprisoned with him. Roman rescued Anna and Tony then went off to save Marlena, who was with Andre. Andre was hospitalized after a sword fight with Tony but escaped. Stefano fled in his limo but after a police pursuit his car wound up in the icy waters of Salem's harbor. Neither Stefano nor his driver Petrov were found. Anna and Tony planned to marry but Alex ruined their wedding by hiring an actor to pose as a minister. It wasn't until Tony and Anna got to Bangkok for their honeymoon that they learned they weren't actually married. Calliope and Eugene joined them and planned to witness a second ceremony but Anna was kidnapped by an Asian potentate named Baba, and Calliope was made part of his harem. The four managed to regroup and returned to Salem, where Tony and Anna were married at the penthouse and honeymooned in Paris. Anna decided to sell some artwork when the newlyweds returned to Salem, but she was bilked out of several hundred thousand dollars by a corrupt art dealer named Claus Van Zandt. When Claus was murdered, Anna was arrested for the crime. In reality, Claus was not dead after all and Anna was eventually cleared of murder charges. Tony disappeared while trying to clear Anna's name. He divorced Anna later without ever returning to Salem. Tony returned to Salem in 1993, engaged to his adopted sister, Kristen Blake, who had fallen in love with John Black. Stefano was back in Salem as well. When Tony learned that his father had been responsible for John's imprisonment and brainwashing years earlier, Tony was furious. They argued and Stefano fled in a car. John fired at the car which had been rigged to explode. Stefano faked his own death yet again. Kristen blamed John for Stefano's death and married Tony, who knew that Stefano was still alive but kept the truth from Kristen. Jennifer Horton served as Maid of Honor and Peter Blake was the Best Man. Kristen wore a floor length fitted gown made of lace with an organza train and organza bows at each shoulder. The wedding took place on February 18, 1994, at St. Luke's Church in Salem. Kristen organized a charity ball at Maison Blanche, the Dimera family home in Louisiana. She and Tony travelled there along with Bo, Billie, Jennifer, and Peter. 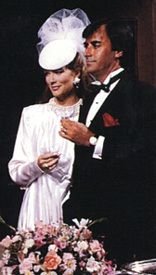 Stefano had also taken Marlena and John there, and lured Roman there as well. A hurricane hit the area and Celeste set fire to the mansion. Tony was blinded in an explosion set off by the fire. John persuaded Kristen to tell Tony that they were having an affair, but because Tony was blind and suffering from a potentially fatal brain aneurysm, she stayed with her husband, even after she learned that Tony had lied about knowing that Stefano was still alive. When John learned that he was a priest, Tony trusted him with Kristen, believing John would not betray his priestly vows. Tony regained his sight but continued to pretend to be blind, after he caught John and Kristen together. Eventually Kristen confessed her affair with John to Tony and she and Tony reconciled. The reconciliation was short-lived, lasting only until John was released from the priesthood. Kristen had her marriage annulled. Tony was diagnosed with a rare and fatal blood disease. Jealous of Kristen's feelings for John, he devised an intricate plot that framed John for murder. In the library of the Blake house in Aremid, Tony rigged John's gun on a bookshelf, placed gun powder on a door handle, and set up an argument between him and John before actually shooting himself. Stefano bribed a judge to sentence John to death for Tony's "murder". Luckily for John, Tony had recorded all his plans in a diary, and the discovery of that diary saved John from death in the gas chamber. On June 21, 2002, the enigmatic and charming Tony Dimera, as suave and dashing as ever, returned to Salem, proving that you can go home again. John reacted with understandable amazement to see the man he thought had framed him for murder standing there before his very eyes at the early anniversary party he was throwing for Marlena at the Penthouse Grille. "Well, well, a welcome home party," quipped Tony. His sudden appearance drew a collective gasp from all who were gathered. After all, Tony had presumably "died" from a self-inflicted gunshot in Aremid in 1995! John nearly came unglued. Tony offered a tidy explanation for his presence. It was his identical cousin Andre who had died in Aremid... Andre had not really died in the quicksand in 1984 as had been believed. "My father's most spectacular sleight of hand... objectively speaking, it was an elegant way to kill two birds with one stone," said Tony of Stefano's scheme. Tony went on to reveal that Stefano was dead, having perished in a car crash. "He wanted me to look after my sister, his precious Alexandra," explained Tony, indignant at Bo's accusation that Tony was actually in Salem to kidnap Zack. He revealed later on to Lexie that he had made a promise to Stefano to "carry on with the Dimera legacy and the Dimera name." Given Tony and Marlena's longstanding friendship and Tony and John's bitter rivalry over Kristen, there is a lot of history between all of these characters. John is making it his mission to bring down Tony Dimera, to Marlena's distress. And there are hints of Tony sharing his father's obsession with Marlena, which is sure to add even more dimension to the ongoing animosity between John Black and the Dimera family. In 2002, Marlena came across a letter from Tony's mother, Daphne Dimera, saying that John and Tony are brothers. Tony to Sami and Brandon:"I'd invite you back, but I'm afraid you might say yes."